She rose up ahead of us, brilliantly lit in all her resplendent orange glory: the Staten Island Ferry, blazing against the dark night sky. 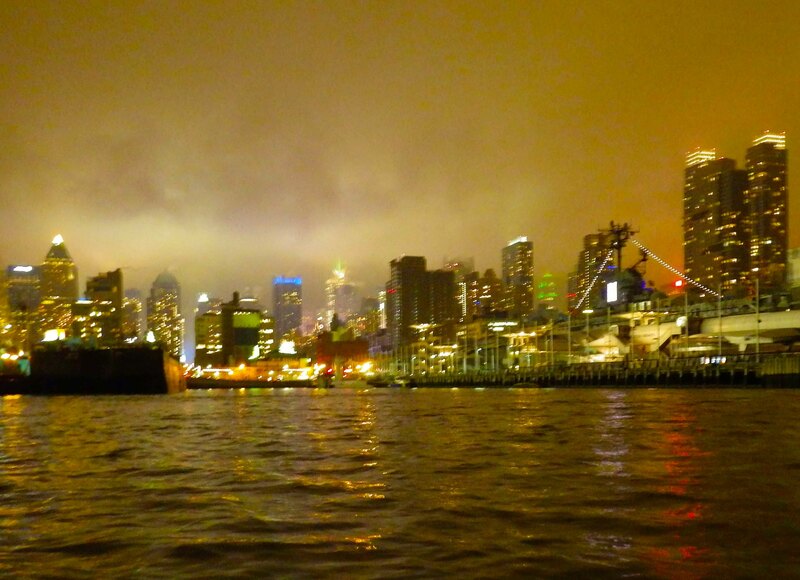 It was around 3:30 AM, and she was docked at Whitehall, at the southern tip of Manhattan. This night was no exception: There were ten of us, and the brisk ebb current was pushing us relentlessly into the ferry’s path. The question was (with apologies to the Clash): “Should I stay or should I go?” Should we bank on the ferry’s remaining docked for the five minutes it would take us to glide past, or should we hold up and wait, back-paddling against the current, while she departed? I thought briefly of calling on the radio. As always, my trusty marine radio was clipped to a pocket of my PFD, tuned to Channel 13, the commercial shipping channel. But I didn’t want to be fiddling with it if the group’s leader decided we should make a fast break. As it turned out, we didn’t have to decide. A loud voice cut suddenly through the silence, coming in on my radio: “This is the Staten Island Ferry calling. Any of you kayakers out there have a radio on?” I grabbed the radio and replied. The ferry captain advised that he was about to depart, and asked us to hold up for a minute or two. I agreed that we would, and yelled out instructions to the group. And then we sat and watched as the ferry majestically pulled out, safety instructions blaring over the intercom. Once she was past, we paddled swiftly by. That had never happened before, in all my years of paddling around New York! Never in my experience has the captain of a commercial vessel spontaneously contacted a kayaker via radio (though they occasionally comment about us when they think we can’t hear). But it was somehow fitting, a reminder that even the most familiar experiences can harbor novelty. It was one of the last nights of summer, with an almost-full moon, and the currents were perfect for an overnight circumnavigation. We were a cross-section of kayakers: Some were whitewater paddlers, others expedition paddlers (one fellow had just completed a thousand-mile-plus trip including a traverse of the Eerie Canal). There was also a healthy contingent of Pier 40 regulars. We left that evening around 7:30 PM, just after the sun had set, and had an uneventful paddle up the Hudson in the darkening evening. We stopped at 125th Street for a snack and a break, and paused briefly again to admire the George Washington Bridge, blazing white and blue against the black night sky. Then it was up and around, under the Spuyten Duyvil railway bridge, and into the long, peaceful Harlem River. We traveled relatively slowly, as is common in a larger group; you move at the pace of the slowest paddler. Overhead, the moon blazed silver-white in a dark, almost cloudless sky, illuminating us perfectly. Although we kept our lights on for most of the trip, as required by Coast Guard regulations, we did turn them off for a short period well out of the way of commercial traffic, just to test how well we could see one another—quite well, as we discovered. We stopped for a longer break and rest at the Peter Jay Sharp Boathouse, also known as the Bette Middler boathouse (since she was the driving force behind creating the boathouse, the first community boathouse on the Harlem River in 100 years). By the time we started again, we were running behind schedule. Slack at Hell Gate had been at around midnight, and the ebb current was already pushing its way up the Harlem River—against us. We kept paddling, past the brilliantly lit buildings, late weekend partiers, and a few stalwart fishermen, until the Wards Island Footbridge hove into view. And beyond it, the East River swirled and roiled, the growing ebb current building up into impressive whirlpools. We plunged into the swirling water. The whitewater folks were in their element: They yelled with glee as the water grabbed and spun them around. For some of the rest of us, the spinning water was more of a challenge. But we all made it safely—including a brief stop at Mill Rock, where those that needed to took a quick bio-break among the rocks and reeds. After the break, we plunged back into the East River. Roosevelt Island zipped by us at a record pace, and soon the Williamsburg, Manhattan, and Brooklyn bridges rose ahead of us. We stopped for a last time at the beach just north of Pier 17, the South Street Seaport, where one paddler wisely called it quits, having come to the end of his rope. He caught a ride back to Pier 40, and the rest of us went on to encounter the Staten Island Ferry. 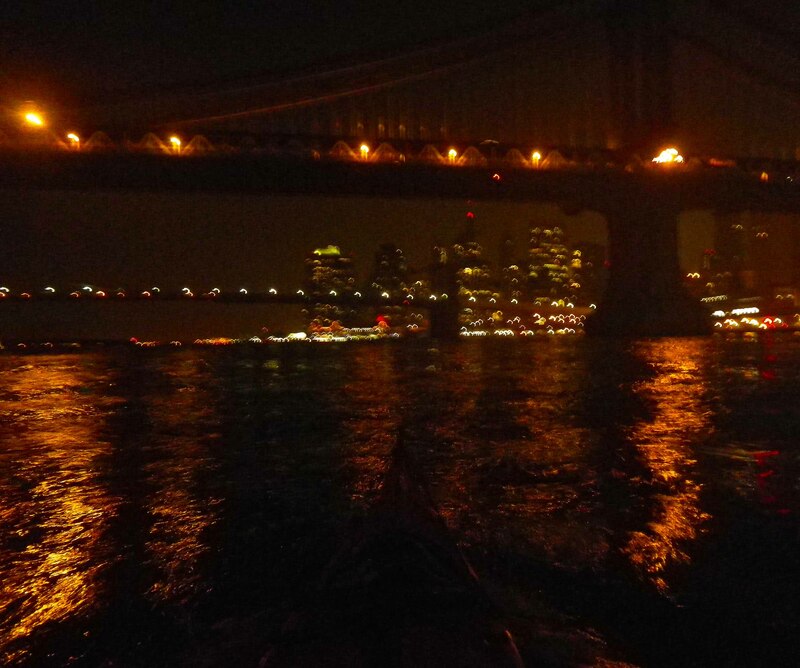 After we passed the ferry, we put our backs into paddling against the current, heading north up the Hudson River. Although the current was against us, the wind was with us, and it wasn’t long before we arrived back at Pier 40 at about 4:15 AM. It had been a long circumnavigation, almost nine hours. We were variously exhausted, exhilarated, or both, and most of us hung around the clubhouse for a time just to rehash the trip. By the time I hailed a cab home, the first hints of dawn were tinging the night sky. It was a perfect celebration of the end of summer. 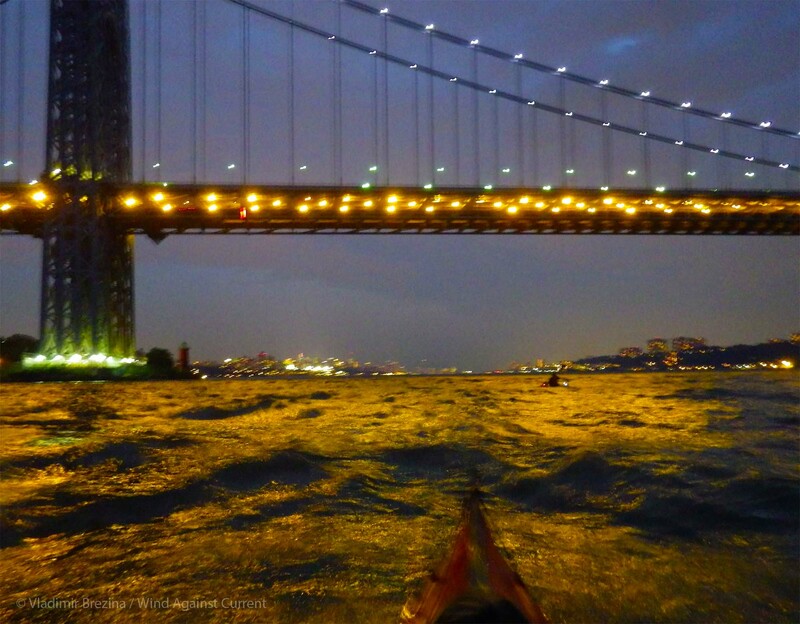 This entry was posted in Kayaking, New York City and tagged Circumnavigation, Hudson River, Kayaking, Manhattan, New York City. Bookmark the permalink. Your account of the threatening presence of the SIF hit a chord. Jeanie and I sat waiting for it to leave its slip when we rounded last month. I thought we were a comfortable distance to the west of it behind a barrier of pilings. The prop wash from that behemoth was startling! Combined with the tidal current we were “enjoying” 5 hours after low water, it certainly added a dimension to our adventure. It is a Monster! That is a busy stretch of water. Nice to hear they called you on the radio. HI George–yeah, the radio call was definitely a first. And second that on the “threatening presence”. Particularly at night…. Thanks as always for reading and posting! Thanks (on behalf of Vlad)! Sounds exhilarating, but exhausting. The perfect end to summer and you told the story so well. Thanks so much, Debbie! It was wonderful. You take some exciting trips in your canoe. I enjoyed looking at these photos. Thanks, Colline! I wish we could convey how it sounds and how the air feels along with the photos. Thanks for reading and posting! What an adventure. I had no idea people kayaked at night, sounds amazing. There are actually a lot of good reasons to go at night. For one thing, there’s less commercial and pleasure-boat traffic, which means fewer wakes, and (all things being equal) easier conditions. But really… it’s mostly the darkness and the moon and the still-slightly-transgressive feeling of being up all night :-)…. Johna, it sounds like a magical journey, full of unexpected occurrences and great beauty. I admire your stamina – nine hours? Wow! HI Lynn, thanks for reading and posting. It was magical for sure! And–not to be boastful–nine hours isn’t actually all that much, particularly when at least two hours was spent getting in and out of the boats, snacking, and resting, and the rest was at a relatively moderate pace. Kayaking is funny—it’s more like walking than, say, running or swimming. Sure, it takes some effort to stay continually in motion for a long time, but it’s an easy, comfortable motion, and you can build up to long hours relatively quickly. If your boat is comfortable to start with, the time doesn’t matter as much as the intensity. Earlier in the summer, I finished the Blackburn Challenge, a 17-mile race, in around 4 hours–and I was completely and utterly thrashed for the next day and a half. But that’s because I was pushing hard. Of course, that requires some degree of acclimatization, which most of us had. Right now, I wouldn’t want to spend nine hours walking, or standing–that would tire me out pretty quickly! But it wouldn’t take much to get there. Oh, you are so modest Johna! My yoga/Pilates instructor, who is in amazing condition, kayaked on our local lake for the first time and couldn’t move for two days. I admire you so much, especially when you take your amazing strength in stride :-) You are always an inspiration. But actually, as Johna says, 9 hours isn’t all that long. On most of our day trips, we paddle for 12 hours, sometimes up to 15 hours or more, sometimes without getting out of the boats. Most people who are paddling for the first time, no matter how strong and fit, can’t do that because they are paddling wrong. They paddle with their arms rather than with their torso. So a certain amount of technique, while it’s easy enough to learn, is essential. And then of course you have to be able to sit in your boat for a long time, which is surprisingly difficult for some people, and in some boats. What a simply remarkable post Johna! I was moved and the Captain was a human being ! Wonderful post, gave me chills cause I could never do it! You’re right! In fact, almost all of them assume we don’t–so it was a pleasant surprise that one even tried to reach us that way. Thanks for reading, and posting! The best way to end summer on an adventure like that. Thanks for the post, Sounds like a wonderful time. Paddle on!!! Thanks Vicki! I just wish summer didn’t have to end, you know? great story, especially the part about the radio comm between the ferry and you. your account also reconfigures what i imagine people do til 4 am some beautiful summer night. and the pics–though not of this trip–fully satisfied me. Yes, that was my favorite part. wow! great adventure and what a wonderful way to end summer! It was discussed, but you know those BCU coaches—drill sergeants! :-) No pizza allowed, hup hup ho!! Thank you for a very nice and evocative post, Johna. You are most welcome Hanna! It was lovely. Thanks for reading and posting! We have developed a saying in Hood River, Wind Capital of the USA and sailing mecca, “Wind trumps Current”. We typically paddle in 10-15 mph winds and 4-7+ current on the Columbia River thru-out the Columbia Gorge. Wind means waves and play time!!! So we usually worry primarily about current in planning the day’s trip. The wind, at least up to a certain windspeed, is secondary. But for most paddlers who don’t paddle in areas of strong currents, wind is definitely the key! Nice post. It reminded me of dodging the Manly Ferry on Sydney Harbour in the half light of dawn. Thanks, and thanks for following our blog!! No problem. You inspired me to get out and do my Manly ferry paddle again! Johna – It sounded like a magical night! With your description, I almost felt like I was there. Johna does make it only too vivid! ;-) Thanks, Catherine! What an adventure. 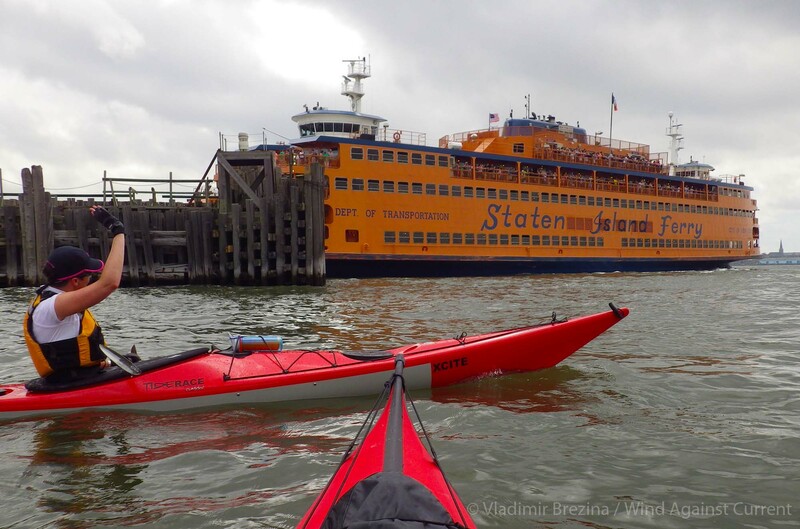 I’m a kayaker too, I can’t imagine almost running into the Staten Island Ferry. Keep writing. Will do! :-) Thanks for following our blog!! Sweet, Wow. Just gotta do this some day. I salute you! Exceptional. What a wonderful way to live. I envy you and hope some day to take on this type of adventure. Thank you for sharing.